Daughter and only child of a pair of well known missionaries to South Africa returned to Texas for the first time in ten years to attend college and working as a DJ on the SMU campus radio station. The information in this section is considered OOC knowledge. Please don't use it in RP unless asking before hand if it's common knowledge or not. Feel free to page or @mail on game. My parents have talked all my life about my twin sister: The daughter that didn't make it. Laine and I were born on June 20, 1984 in Fort Worth, Texas at JPS Hospital; Laine died four days later, on June 24, 1984, at Cook Children's Medical Center in Dallas. Sometimes I wish that they had named me Laine instead of Ianthe. It's not like she's using the name, after all, you know? Anyway, when I was about a year old, my parents decided that they felt 'called' to be missionaries to some foreign country, which is really funny if you think about it, but I'll get into that later. I only lived in Fort Worth until I was a little over two years old and my parents decided to pack us up and move to a small town about thirty minutes north of where we were living called Justin. There's actually a Justin Boot outlet store there in Justin at 407 and 156. Oh, right! 407 on the west side of 156; it makes a little jog about a mile south from the east side of the 'highway' to the west side. It's actually two stores, the retail shop and the outlet, one on the north side of 407 and the other on the south side, but that's just trivia. It doesn't really pertain to my story other than that I /love/ Justin boots. It's all I wear now that I'm back in the states: A pair of lace up ropers, a pair of sneakers when I have to go running, and a pair of black leather heels for when I have to dress up. Now where was I? Oh, right. When I was two. That's about the same time that Mom and Dad started going to this pretty big church on Western Center in Fort Worth. North Fort Worth Baptist, actually. It wasn't a super church, not like the Fellowship is now days, but it was big enough, anyway. I guess it was alright. I don't really remember that much of it, though. We didn't come back for furlough that often, but we'd go there when we were in the area. It /was/ our home church, after all. Anyway… I started kindergarten at Justin Elementary, back when it was still on College in 1989 and my parents signed me up under my middle name: Jeanine. It's not much better, but at least it's not Ianthe. Right after my first Christmas break from school, I over heard my parents discussing where they thought they should go to, and I quote, spread the good news. That was the summer that the girl that they'd been leaving me with a couple nights a month while they went out on a 'date night' moved to Oklahoma to go to college and they had to find a new babysitter for me. I ended up in the care of a girl named Tammi that was going to be graduating from TWU the next year with a teaching degree. Well, long story short, they managed to talk her into moving to South Africa with us the summer of 1991. Africa was… Well, it was pretty cool, actually. Yeah, it was hot, but there were all these awesome animals that would come up to the village we lived on the outskirts of. Since Mom and Dad wanted me to get some sort of an American education, even though we weren't /living/ in America, Tammi taught me and a couple of the other kids in the village. I guess it was some sort of missionary work that my folks arranged, but it was still school. It just meant that I didn't have a large class or anything like I would have if I'd stayed in Justin with all my friends. Tammi would still keep me a couple of nights a month while Mom and Dad kept their monthly dates, but I never was sure exactly what they'd /do/ those nights of the month when the moon was the fullest. When I was thirteen, Mom and Dad and a group of their friends took me out with them for one of those photo safari things that were getting popular. The adults were all taking as many pictures of animals as they could, but they were /only/ taking pictures of animals and most of them were ignoring the birds, which I thought was totally weird. I mean, birds are pretty amazing creatures and I've always admired them. Anyway, suddenly one of them, I don't even remember now if it was one of my parents or if it was one of their friends, pointed out a beautiful African wild dog that was trotting from one bit of cover to another. What's an African wild dog? Well, it's something like a cross between a greyhound and a lion, I guess. 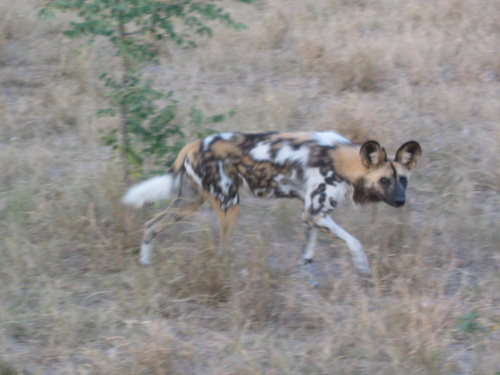 They're called painted dogs, too, sometimes, but they're usually /really/ shy animals; it's a real treat to get to see one in the wild. Well, this one was bold as you please walking right out there in the open and the painted dogs had always been my favorite animal. This one had large patches on white on it and the orangy-brown patches were outlined in lines of black, sort of like a coloring book picture. Anyway, I guess I kinda got a little excited getting to see my favorite animal in person in the wild and all, but the next thing I knew, I was running away from the jeep as fast as my four legs could carry me. Yes, I said /four/ legs. That's the day that I found out just what my parents, and their friends too, apparently, would do for the nights of the full moon: My parents and I are pure shifters. We can take on the form of any animal that we see, whenever we want, but we have to change at the full moon. Let me tell you! It's strange finding out that your parents dragged you to some foreign country and that you're not even /human/. Oh, sure, we /look/ human enough, but our senses are better and we can turn into any animal that we can look at. I heard my dad talking about a guy he'd met in California when he was in college that liked to take on the shape of a sea lion. Sounds pretty strange to me, but I suppose it could be cool, too. Well, since the last animal I saw before I shifted for the first time was a painted dog, that's the shape I take if I don't have a picture or another animal to look at before I change. It's also the form I take on the full moon. Like it or not, I'm some rare endangered species. That's something that took a little getting used to, let me tell you! Anyway, all that happened back in 1997. That was the last time we really went home on furlough. Mom and Dad decided that, since it's hard for an adolescent two-natured to control their shape, that we'd stay in South Africa for a while. At least until I was eighteen and old enough to make my own decisions. The next five years were an adventure, let me tell you! I went on more photo safaris with my parents and their friends, some of whom were pure shifters like us and could take on /any/ animal form, and others that were stuck with just one (which I really found kind of sad. I know that /I/ wouldn't want to be stuck with just two bodies, but I'm one of the lucky ones.). I never did get the hang of flight, but I loved to run! Well, when I turned eighteen and Tammi told me that I'd officially graduated, Mom and Dad told me that they would support me if I decided that I wanted to go back State-side to continue my education. We talked about it for a couple of months and did some research into scholarships and stuff that were available to the children of missionaries, and found a couple that I could apply for. I think I was more shocked than anyone else when I got a full ride to SMU back home in Dallas. Yeah, I'd have to keep my grades up, and all, but it meant that I could get my degree and then go on to do whatever I wanted with my life. That was 2002. A year later is when the world learned about the existence of vampires. I was hanging out in the student union with a couple of my girlfriends and there was some sort of a special report that aired. Well, I was pretty hungover still from a party the night before, but Jessica caught what was said and sent the rest of us into a panic! Well… A mini-panic, anyway. It's kind of hard to be freaked out about vampires when you're a shapeshifter, after all. I'm almost ashamed to admit it; I mean, my parents taught me better. They taught me that there is good and evil in the world and that killing is evil. That drinking blood is evil (it was what got Dracula cursed by the Catholic church and excommunicated, after all), and here are /vamps/ admitting that until synthetic blood was proven as viable that they drank /blood/! Anyway… I'm almost ashamed to admit that vampires coming out of the coffin really didn't change much for me. I still kept going out like I always had before. I kept going to class, even though there was one girl that was in a night class I was taking that admitted to being one of /them/. She dropped the class a couple of weeks later. I'd taken an interest in music and broadcasting while I was getting settled back into American life, and decided to major in radio broadcasting. I got a job working as a DJ on the campus radio station last year, and I've been working there and studying hard ever since. I never heard from the vamp that had been in my class again, but I think I heard that she's taking some internet courses. Not sure how that works, but okay. Ian is an adrenaline junkie and totally fearless. Most of the time, anyway. She's lived in the African bush and knows exactly how to keep from getting in trouble when it comes to wildlife and the country, but the big city is a little bit of a mystery to her. She's always willing to take up a challenge, though, and she's refusing to allow the city to intimidate her. She's talkative and outgoing, partially to make up for being so shy when she first arrived back in the States, but sometimes she's still overcome with shyness and finds herself unable to talk, usually just around shifters that are larger than she is or werewolves. She has a passion for music that makes her open up to anyone that shows the slightest bit of interest, usually indie bands that few people have heard of or native music, whether African, Indian, or Native American. She genuinely wants to help people that are less fortunate than she is and is a fiercely loyal friend once she has gotten to know someone well enough that she wants to gift them with that title. She has a strong sense of faith that her parents instilled in her throughout her childhood that lends her strength when she is afraid or finds herself overwhelmed by a situation. She believes like her parents do, but she's not quite as vocal about it. She has no desire, at this point, to go to another country and lead the heathens to the Savior, though she considers herself a Christian and will gladly talk about her faith to anyone that is truly interested. Ian's main form is that of the African wild dog, also known as the painted dog. Since this is an animal that isn't native to Texas, she has to be extra careful not to be seen when she takes this form. She has to remain conscious to maintain this form and, when she reverts to her human form, has no clothing due to the fact that clothes do not shift with her. Ian has been a DJ for over a year now and, as such, has learned how to fill silences with talk. She knows how to work much of the machinery that keeps a radio station running and is learning more everyday. Ian grew up both in small town Texas (until she was seven) and then in a small South African village in the care of American missionaries. The one time that Ian tried to take the form of a bird and fly, she crashed and ended up with a concussion and broken arm. Her arm was twice as long healing because she managed to re-break it during the full moon a couple of weeks later. Although Ian is a US citizen by birth, she spent nine years of her childhood in another country with a very different culture. This sometimes leaves her feeling like an outsider even among her friends. Her faith can be a powerful asset, but it also leaves her somewhat hidebound and unwilling to bend when something goes against her beliefs. Being a shifter isn't an easy prospect for a college student by any means. When in her animal form, she has to remain conscious or she'll return to her human form. She has to shift on the nights of the full moon whether she wants to or not. She is as mortal as any human and can be killed just as easily. She has never tried it, but V does nothing but make her ill. She has the instincts of an animal, though this can be an asset at times, it can also put her in a situation where her human side thinks that one thing should happen and her animal half fights her. It also can take her upwards of hour to become accustomed to being human again after being an animal if she's been in that form for a while, and she is a little unsteady for the first little while if she hasn't spent anytime on four legs in a while. Trevor Shifter Acquaintance He's a friendly guy I met at the lake. Nice to know there are guys around Dallas that aren't just interested in staring at girls. Sticking With You Addison Road Friendship If I have to jump, then I'll jump and I won't back down. You can cry, you can fight, we can scream and shout. I'll push and pull until your walls come down and you understand… I'm gonna be around, cause I'm sticking with you. Take Back the Night June 8, 2005 June 8, 2010 Hope volunteers at the Take Back the Night booth, and potentially finds herself a DJ for the wedding. A word of warning June 9, 2005 June 9, 2010 Ian is getting in an evening of studying at the deli when Michael catches her staring. Don't forget to stretch June 10, 2010 June 10, 2005 Trevor is relaxing at the lake when a runner stops to stretch on his bench.